Guy was born in Malaysia in 1981 and moved with his family to Melbourne, Australia at the age of 6. After turning 10 his family moved to Adelaide, which they were to call home for all of Guy’s teenage years. Guy’s interest in music started at a young age, taping his favorite songs from the age of four. It was at the age of 14 that Guy started singing. 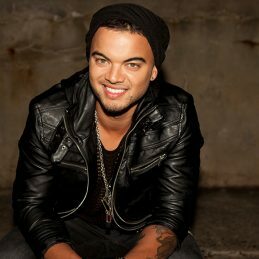 Over the course of his career Guy has received 22 ARIA Award Nominations including Single of the Year, Best Male Artist and Best Pop Artist, and won the ARIA Award for Highest Selling Single for Angels Brought Me Here and Who’s That Girl. Altogether, Guy has released 11 top ten singles, and three other top 15 singles. Six of those singles have achieved multi-platinum certification, including the 8x platinum Battle Scars. With 42 platinum, three gold certifications and combined album and single sales over 3 million in Australia, Guy has one of Australia’s best success stories. And in August 2013, Battle Scars went Platinum in the US, with Guy being one of few artists in Australian music history to achieve this. His debut album Just As I Am once again dominated with record breaking sales. The success carried effortlessly into his second album, Beautiful Life, where Guy took more control of his craft, giving audiences a clearer perspective on his work without the weight of Australian Idol in his shoulders. Beautiful Life went Double Platinum earning him another Number 1 single Out With My Baby, which also scored him a 2005 MTV AVMA for Best Pop Video. A sell-out live tour showed the country he was more than just an as-seen-on-TV star with big hair – he was a genuine musician who oozed talent. Having sold a staggering half a million records, Guy released his third album Closer To The Sun in September 2006. The album has to date reached platinum status and continues to sell strongly with three singles having being released. In 2007 Guy won the publicly voted ‘Fave Aussie’ gong at the Nickelodeon Kids Choice Awards in Sydney for the third consecutive year. Guy also partnered Sarah Ryan three-time Australian Olympic swimmer on the Seven Network program It Takes Two. In May 2007, Guy performed with a 60 piece Australian Philharmonic Orchestra for three special shows at the Sydney Opera and Hammer Hall, Melbourne. All of these shows were sold out. Also in 2007, Guy recorded his fourth studio album in Memphis, TN entitled The Memphis Album, which is a collection of the greatest soul songs ever to come out of the Stax Records label. For the recording sessions he assembled many of the musicians who wrote and played on some of the original tracks, including some of the greatest musicians of all time including Steve Cropper and Donald “Duck” Dunn. The Memphis Album was released in November 2007 and sold more than Double Platinum, taking Guy back to the top of the charts. In March 2008 the entire Memphis band joined Guy on his national Australian tour. The tour was met with critical acclaim and was nominated at the Helpman Awards for ‘Best Tour and Live Performance’. In October 2008 The Memphis Album became Guy’s third album to be nominated for the Highest Selling Album category at the prestigious ARIA Awards. In 2008/2009 Guy moved to the US to record his 5thstudio album. He spent time in Los Angeles recording tracks for the album with John Mayer, whose legendary guitar playing features on four songs. The remainder of the album was recorded in New York. In August 2009 the title track of the album Like It Like That was released and went straight to the top of the National Airplay and ARIA charts giving Guy his 4th#1 single. The song was picked up by NBC in the US as the theme song to their national summer roll out campaign. Channel Seven also picked up the song to front their summer roll out across Australia helping take the track to the highest selling Australian song on iTunes in 2009. Guy’s5thstudio album Like It like It That was released in November 2009 to critical acclaim, with the album going Platinum and the title track Like it Like That going triple platinum.